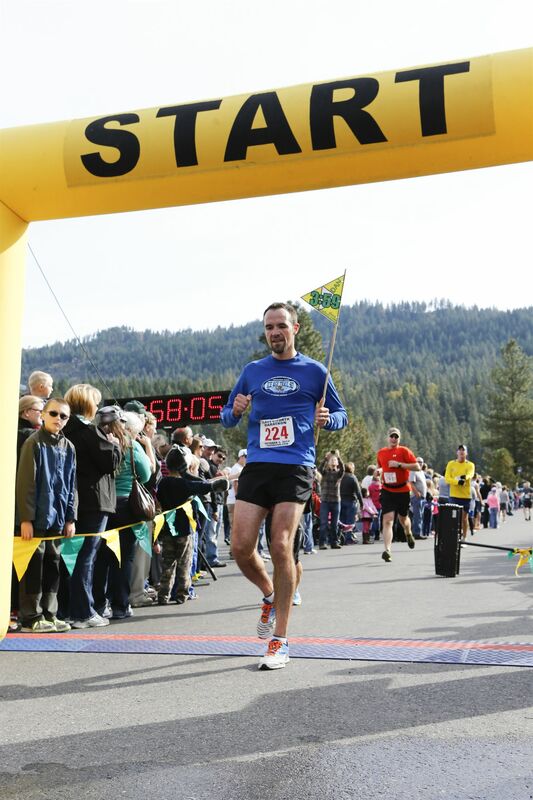 My desire to run the 2013 Leavenworth Oktoberfest Marathon, a relatively small race in central Washington, was borne out of escalation and frugality. Last summer, I ran two half marathons in two states over one weekend, which meant that it was only a matter of time before I attempted the same feat with two full marathons. 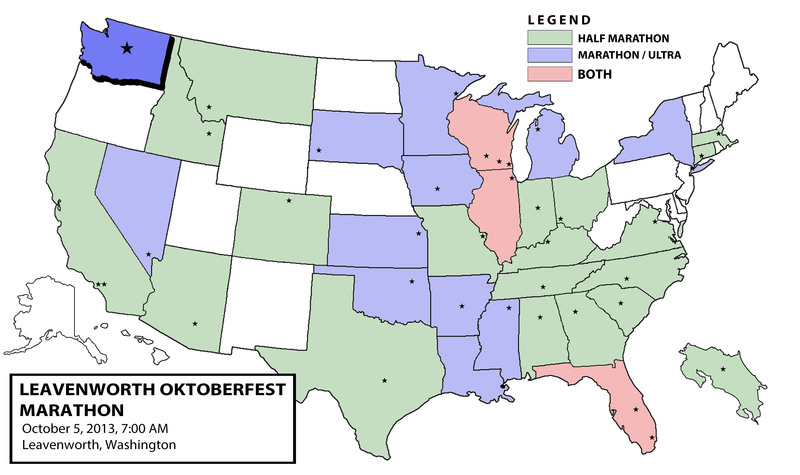 Having already committed to the 2013 Portland Marathon on October 6, I then decided to save money on my 50-states quest by only flying to the Pacific Northwest once. Within minutes of finding the Leavenworth Marathon, an event that takes place the day before about 5 hours away, I asked Otter if he’d be interested in a double. As we’ve all learned, his impulsive thirst for adventure easily outmatches his restraint and reason, so by January, we had our two huge challenges for 2013 clearly mapped out: run a 50-miler and then double-up on marathons. The 50-miler was a success … for Otter. He crossed the finish line of the North Country Run with a kick in his step, literally dancing across the finish line, while I chose to drop out just before mile 40 due to a knee injury. My biggest justification (or reason or excuse) for doing so was to minimize the chances of canceling the marathon double, just six weeks away. It wasn’t the easiest decision to make, but I kept reminding myself, often loudly, of the main goal: run all fifty states. After coming to terms with it, I rested, cross-trained, and built up my mileage back to the usual load. My knee was responding positively, not a single twinge or stab to report. After a painfully long Friday, I arrived at the Coast Hotel in Wenatchee, Washington, into which Otter had already checked us. I brought with me our bibs for Portland and a pair of objects that would put a completely new twist on our marathon experiences. But before I say what they were, I must take step back. Running two marathons in two days is, by many accounts, a little nuts. To the average person, running just one marathon is excessive and even for serial runners, they’re simply difficult. So to do two consecutively requires a little more training, an affinity for fatigue, and the stamina to continue pushing yourself when every muscle is ushering you towards collapse. However, even with all of these discouraging factors, there are many people who double-up anyway. In fact, many nutcases go beyond two. There was even last year’s infamous Quadzilla in Seattle, which hosted four marathons over the four-day Thanksgiving holiday weekend. The Mainly Marathons series one-ups them by routinely hosting up to five consecutive marathons in five different states all around the country. So it’s not at all uncommon. But what I have noticed is that, for the most part, whenever intrepid runners double-up, they tend to run each race at a very conservative pace. In other words, really slowly. I don’t mean to disparage anyone’s accomplishments because it still takes a lot of dedication, endurance and mental willpower to cover 26.2 miles twice in one weekend. But for me, the marathon has always been there to push me to my limits, forcing me to cross every finish line with nothing left, each drop of sweat and spit forever grafting itself on the experience. But I’m also not stupid. There’s no way I could gut it out as fast as possible two days in a row. I therefore decided the best way to challenge myself over the weekend without dying was to run both marathons in under four hours. The four-hour mark was my target at my first ever marathon (which I missed by 3 minutes and 21 seconds), so it felt appropriately difficult. So after a five-hour drive from Portland, I met up with Otter with a pair of homemade pacer signs, one with a Triforce inspired by the Legend of Zelda emblazoned with “3:59” and the other boasting a Michigan State Spartan head showing “3:58.” Why the minute difference? Because that way one of us could sprint the last 0.2? Because it’s a conversation starter? Because Otter is obnoxious? And yet, the pacing signs weren’t simply the product of an urge to do something new. We both knew ourselves very well – we never stick to our race plans. If we ever say we’re going to take it easy during a race, adrenaline inevitably takes over and we push ourselves to run fast. If there’s ever a reason to take it easy, we kick it to the curb and step on the gas. But with an additional race on Sunday, we knew we had to find a way to anchor ourselves to a 9-minute pace. We achieved that by becoming the race’s only unofficial pace leaders. 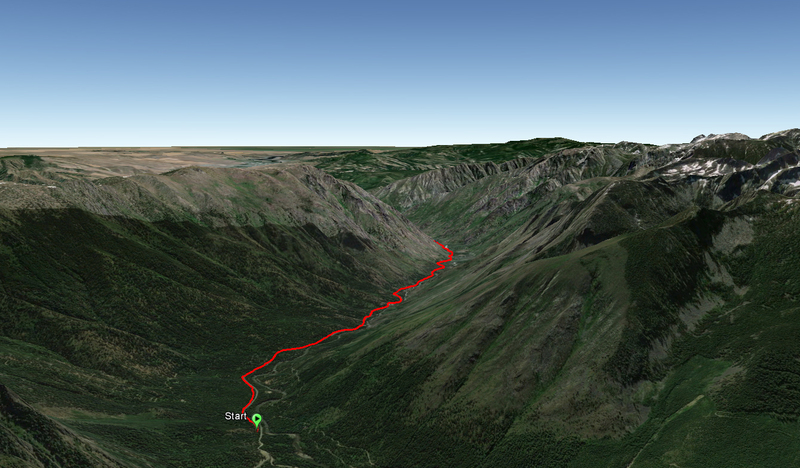 For the full Google-Earth map, please click here. 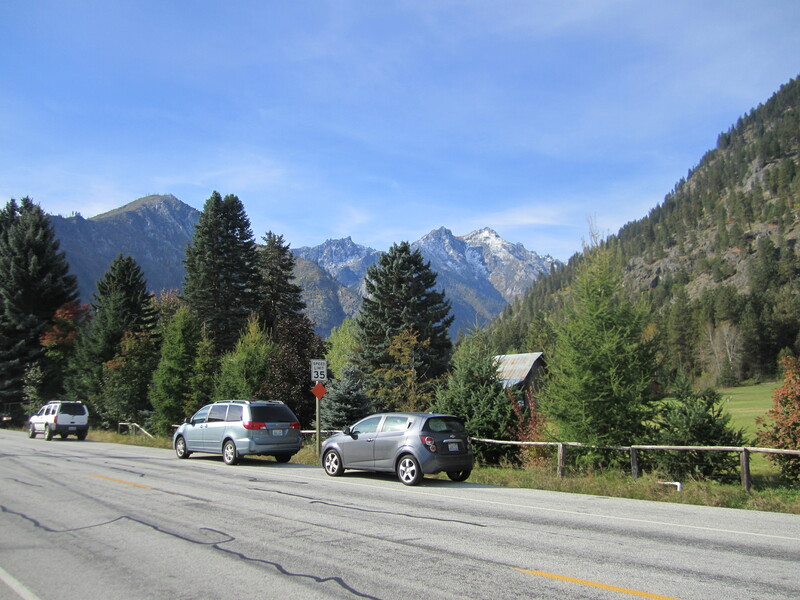 The next morning we boarded a bus around 6:15, which left the tiny town of Leavenworth and climbed Icicle Road to the marathon start. We would be running about ten miles downhill from the start to the city, with the half marathoners (all 1500 of them) not starting until two hours later. It was dark and chilly as we wandered around the start, drawing attention with our pace signs from the 300 other marathoners. Several of them asked why we were the only pacers, whether we would run even splits, and why Otter’s was a minute faster. 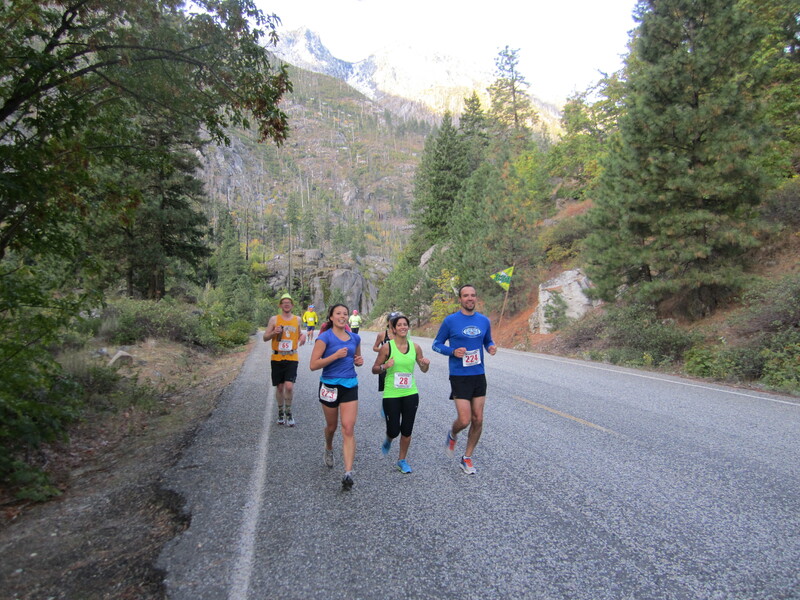 But mostly we smiled and reciprocated everyone’s enthusiasm to run down a rugged canyon carved by Icicle Creek. The race started on time with very little pomp or circumstance. There was a slight uphill to contend with before the long downhill. Otter and I spent those first five minutes gauging our pace, spending equal amounts of time enjoying the view and checking our watches. It didn’t take long to settle into a comfortable stride between 8:55 and 9:05 minutes per mile. With the vast majority of the field waiting for the half marathon to start down in the city, I was unsure if we would gather enough runners to warrant being pacers. I even mentioned it about a mile into the race. “Dude, look behind us,” Otter said with a proud smirk. As if trying to furtively evaluate the attractiveness of someone sitting behind me at a restaurant, I turned somewhat awkwardly to see that there were about seven or eight people all bunched up immediately behind us. Sure, it was still very early in the race, but it looked like our signs’ gravity was working. I couldn’t help but smile. Down and down we went, hovering steadily at 9 minutes per mile, doing everything possible to avoid a screaming pace. We were soon talking to the runners around us, getting to know our 4-hour harem. 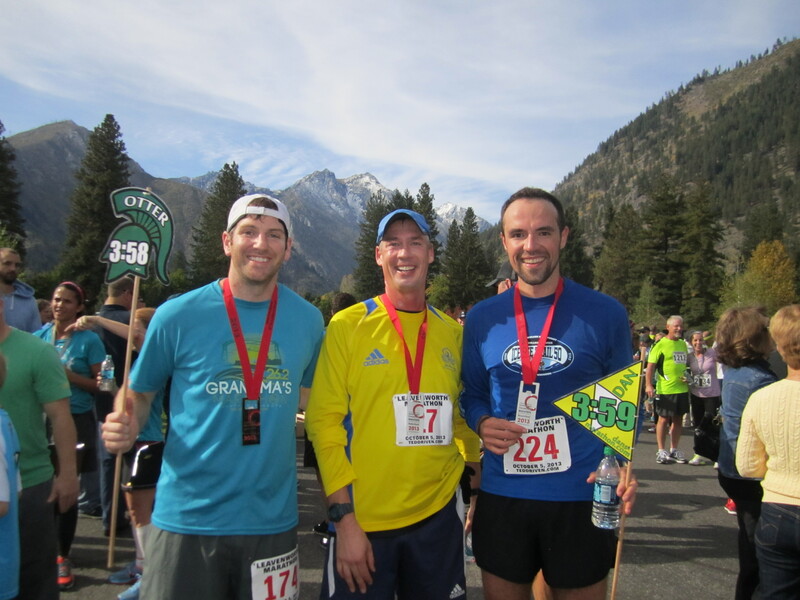 There was Jeff in the yellow singlet, who quit smoking two years ago and took up running as a substitute, choosing Leavenworth as his first marathon. I met Mary and Nora, two childhood friends from Juneau, Alaska, running their third and second marathons respectively. They also pitched the Frank Maier Marathon to me as a potential race. We also met Bean (whose real name is Mark Bieber and has a brother named Justin), whose 3:19 PR makes him a speed demon and an unlikely runner in our group. It was a great group of newcomers and veterans, all more than willing to share their life experiences, none moreso than my co-pacer Otter. “When we decided to do this,” I told Nora as we continued downhill about six miles in, “I told my buddy back there that I wouldn’t be much of a cheerleader. I just can’t bring myself to be that pacer who yells inspirational things and rallies everyone into battle. Which is why he’s here.” It was common for me to eavesdrop on him talking about a race or an unrelated yet colorful story, receiving hoots from whomever was next to him at the moment. While we had started chatting with our group, the mountainous scenery and breathtaking views were not lost on us. We would frequently pair a loud “whoa!” with a quick fling of our pace signs to our sides, pointing out a snowcapped mountain or a dew-drenched rock. Hours earlier at the start, we were thrilled just to see stars. On more than one occasion, someone from our pace group would chuckle and we’d have to remind them that we flatland city boys didn’t have such monumental vistas in Chicago. I was having such a fun time with this group. In both training and races, I’m a solo runner. Even on the rare occasion that I join a pace group, I don’t really do much talking and inevitably bail on the group within a few miles. But the banter and fun demeanor of our little pod was making for a singularly unique running experience. It’s one thing to run in a group where you’re the follower or no one’s the leader. But in this case, we were leading the group, setting the pace and everyone was having a good time. Since we could have counted the number of spectators up until this point with one hand, it was fun to have people to talk to. I was legitimately saddened that it didn’t last. Somewhere between miles 21 and 23. Once we hit mile 10, the downhill stopped. No longer aided by gravity and wanting to keep even splits for the entire race, running the same pace quickly became taxing. After a short out-and-back over a paved road and around a cemetery, we passed a few spectators in costume. We saw Tigger, a few Sumo wrestlers and Gumby, whose normally pinched helium voice had been replaced by a hungover drawl. A mile later, we were in a forest, running on pine straw and sand, climbing up gently rolling hills and zigzagging through sharp turns. Our pace was no longer a cakewalk and we dropped everyone but Bean. “What made you want to pace this race?” he asked us. 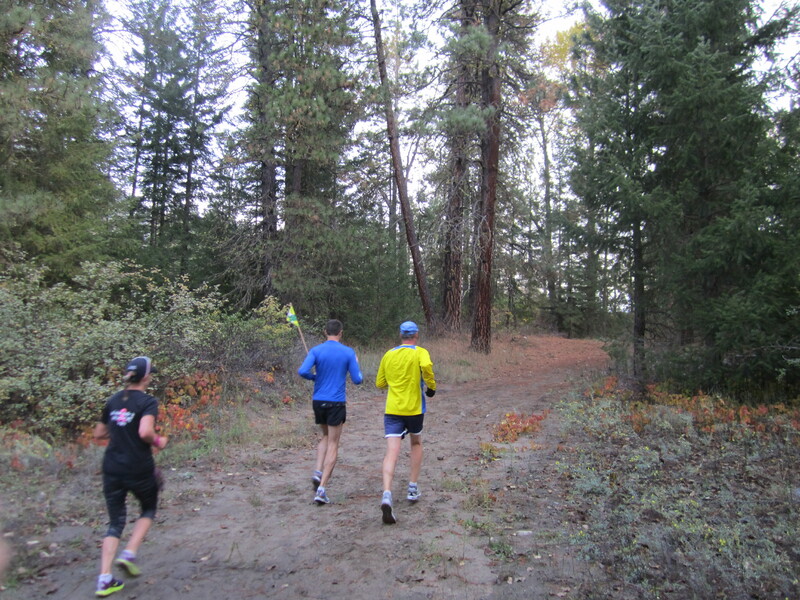 After several winding turns through forest trails, we entered the Fish Hatchery where our packet pickup had been three hours earlier to behold a huge crowd of runners under a large yellow “Start” banner. I scarcely had a chance to enjoy the flood of half marathoners before a bullhorn went off. We had reached the half start in just under two hours and our races officially converged. It felt like we had invaded a completely different event. Just two minutes ago we were three people plodding through the woods, now surrounded by hundreds of fresh faces. I thought the infusion of so many half marathoners would make our pace group grow again to what it once was. Surely among so many runners we would be able to attract a group with two hours as their half marathon goal. But over the course of the next 13.1 miles, we didn’t manage to pick anyone up. Keeping a solid 9-minute pace, we weaved in and out of neighborhoods, through the tiny town of Leavenworth, on dirt trails alongside Icicle Creek and back onto paved roads where I had my first mid-race beer sip. 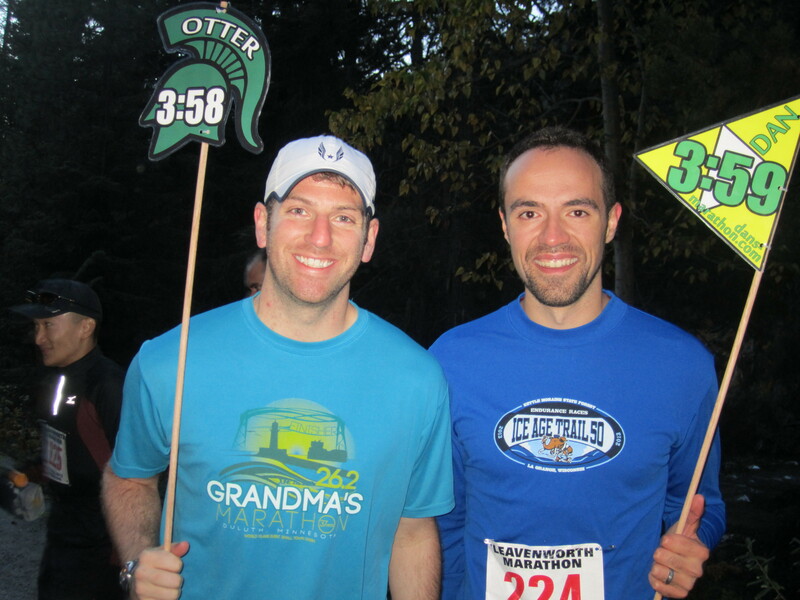 Otter and I would remark on how incredibly varied the race was. It wasn’t until miles 20-24 that we got just a little bored. This section consisted of two eerily identical out-and-back segments, to the point where I commented that it felt like a Twilight Zone episode. On the way back from each section, we made sure to keep our eyes open for our marathon friends. We saw Jeff, chugging along confidently and not too far back and Nora gave us a shout-out before zipping by us. Bean’s wife was running the half marathon and she passed us during one of these sections. She didn’t feel at all ashamed about leaving her husband in the dust and he chided her for running only half the distance. In retrospect, it was really nice of him to stick with us, especially since he was capable of running so much faster. Had he not stuck around with us for the entire race, we would have just been a couple of weirdos waving sticks at pretty things. He definitely had a point. The last miles of any marathon are awful no matter how good you feel. But today we had found a happy medium. We weren’t exactly phoning it in by finishing under four hours, the aches and pains in our legs certainly bearing witness to the struggle. But we weren’t killing ourselves doing it either. It was, dare I say it, fun. It certainly helped that we were running a beautiful race surrounded by mountains and forest, put together by volunteers and local supporters who were cheery and happy to be out there. We emerged from the trees and back toward the fish hatchery, where the bright yellow banner awaited us. A crowd had formed on both sides of the chute, multiplying the total amount of spectators we had seen all day by fifty. Though we had only brought one person to the finish line (and he could have easily done it without us), I was proud of our pacing duties. Sure, we were a little fast at 3:56 and 3:57 respectively, but we ran evenly the entire way. If I ever pace in an unofficial capacity again, I’ll make sure to add an “ish” next to the time. Although we really wanted to stick around and cheer for our marathon friends, our hotel checkout was within the hour, so we couldn’t stay for long. With our shiny bottle-opener medals and finisher t-shirts draped on our shoulders, we found our car and drove back to the hotel. We didn’t have the post-marathon luxury of doing and eating whatever we wanted. In order to not melt down at tomorrow’s race, the next 12 hours would be crucial. We had to force food into our systems, stay hydrated, drive five hours to Portland without too much muscle atrophy, hydrate again and eat some more. With so much to think about, coupled with nervous uncertainty, I didn’t get a chance to realize that my knee never once complained. Running a marathon in all 50 states because there's no better way to explore the world around you than on your own two feet, for as long as you can, until you hate yourself and everything around you. Then you stop, get a medal, and start over. Great race! Your signs cracked me up… if only I could have been in your pace group. Bean is my spirit animal. Except fast. He was definitely an animal, and I’m sure he consumed his fair share of spirits post-race. Quickly. Thanks for the entertaining race report! Love the pace signs!! I laugh every time I picture the two of you running the whole marathon with those sticks in your hands! Looking forward to reading about Portland! Hilarious! You guys crack me up… and now, I admit, I am going to steal your pacer sign idea one of these days. Great report as always! It was actually really fun. And believe it or not, those pace signs never felt weird to hold. I figured by the end of the race we’d be holding them closer to our waists, but they stayed up the entire time. Find a small marathon and ask to pace and I’m sure the organizers will let you. so glad there were no issues on day one. Usual great read. Makes me want to roll up the Oreos and get to it. Well told Dan, and nice job in conveying the sheer joy of running. It says a lot about the sport that, despite its focus on individual accomplishments, running really thrives because its community is such a social animal. Very cool that you and Otter were able to tackle your Pacific NW adventure together. 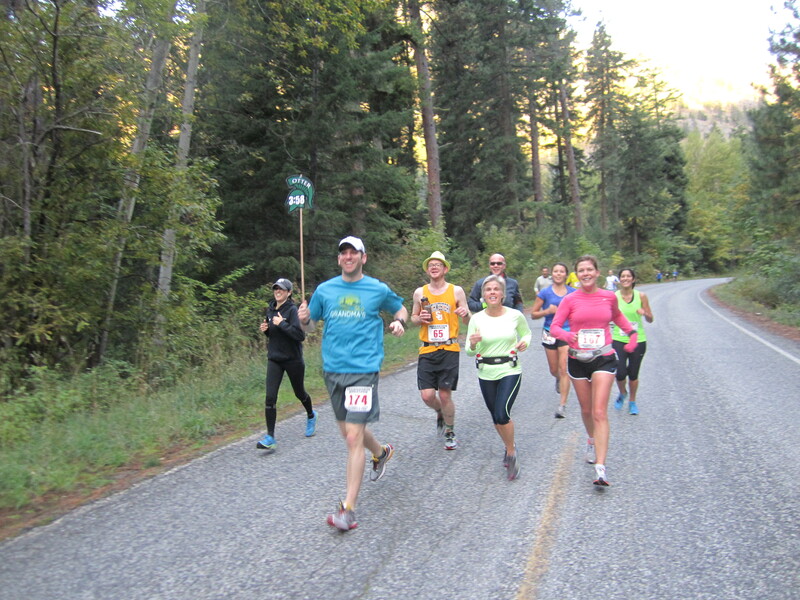 Between pacing their race and writing a glowing review, the organizers should make you the official face of the Leavenworth Marathon. Congrats on a strong 3:57, and here’s hoping you can now expunge the words “knee pain” from your writing lexicon. As for being “a couple of weirdos waving sticks at pretty things,” (anything wrong with that? ), it’s often said if you’re poor you’re “crazy”… but if you’re wealthy, you’re “eccentric”. Sounds like Bean kept you out of the poorhouse on Saturday! Oh, and don’t forget the Savage Seven in Ocala, FL – 7 marathons on 7 consecutive days, all on the same 5-mile loop course. What better way to spend your productivity-free week between Christmas and New Year’s? Anyway, I really wish I had incorporated your comment into my write-up, namely the part about how racing can sometimes bridge that gap between individual accomplishment and collective support. Pacing by itself doesn’t necessarily do that because a pacer typically runs well below their threshold pace and does it largely to help others. But in this race, we were pacing ourselves so our future selves could run another marathon the next day. It’s a little recursive but it makes sense if you think about it. In that way, we had both the individual accomplishment (keeping ourselves in check) and the collective goal of moving people along a course. Good times, I say. This unofficial pacer idea is great! 🙂 It is definitely a fun way to experience the race from a different perspective. I am more a loner when it comes to running, but your experience clearly shows that every runner has a unique story and a reason that lead to the decision to sign up for that race and running together with others is a great way to learn more about everyone. Thanks for the comment, Laszlo. We loners are a peculiar bunch, especially those of us who run without music and simply enjoy the experience for itself. However, breaking that trend (if only on occasion) proved to be very fun. The next time I have a marathon without an aggressive time goal, I will definitely volunteer as a pacer – especially now that I have experience! I look forward to reading about your Chicago Marathon experience. Thanks for reading 🙂 Speaking of Crazy, did you see that they had to cancel Run Crazy Horse this year due to a freak early season blizzard? 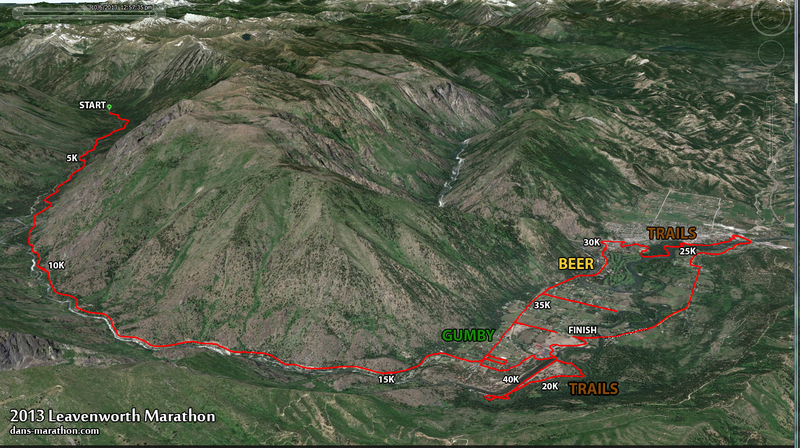 I’m running the Leavenworth Marathon tomorrow. 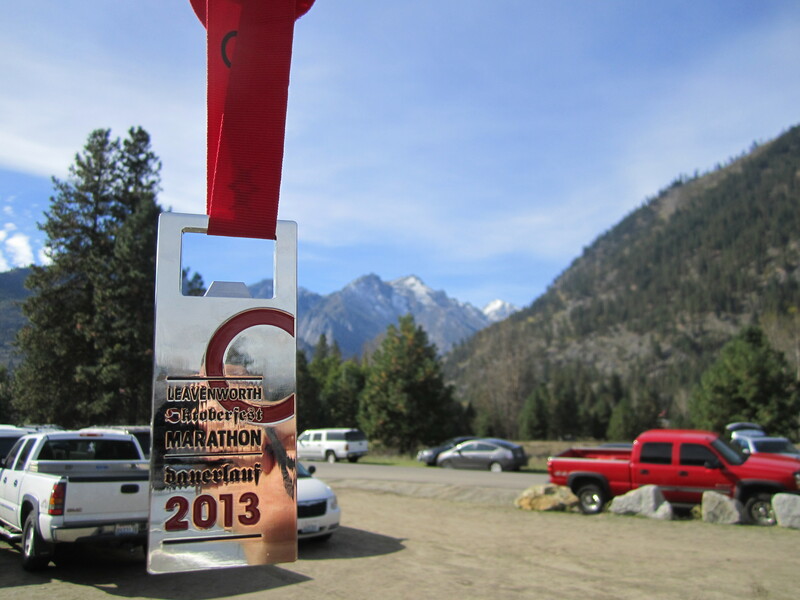 This is my 3rd full marathon, first for Leavenworth. After reading this, I feel way more prepared and kinda-sorta know what to expect. My goal is to also finish under 4:00:00. I would be very happy with 3:57:00-ish. 🙂 If you two were the unofficial pacers this year, I’d be right there with you! Dan's Marathon by Daniel A. Solera is licensed under a Creative Commons Attribution-NonCommercial-NoDerivs 3.0 United States License except where otherwise noted.